Eine beeindruckende Uptempo-Nummer, benannt nach einem Kriegsschauplatz im Vietnamkrieg. Die Singleauskoppelung vom Mai 78 aus ihrer Debüt-LP erreichte in den australischen Charts zwar nur # 48, wurde aber im Lauf der Zeit einer der absolut bekanntesten und beliebtesten Songs in Australien. Good song from a good band. Fantastic song! True Aussie classic, and within my top five Australian tracks of all time. Jimmy Barnes is a legend. Urgh, really not a fan. Originally peaked at #41 in Australia, 1978. 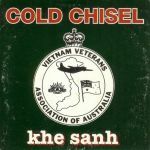 It's great to see the Chisel back in the charts after the death of their drummer earlier this year and legendary is this song, got to be the greatest Australian song of all time. FINALLY this song gets the commercial success it deserves! Classic song from this band who come from Elizabeth (I think) and whom my dad was good friends with, I guess, 'back in the day'. :P<br>It's hard to believe such a well known Australian song only made it to #41! Apparently a classic Australian song. Every time I hear those opening piano notes I want to slit my wrists. Average track that I have only heard a few times despite being a classic. Lyrically very good but the rest isn't totally to my taste. It's a good song though and definitely an Aussie classic. Fängt ganz intressant an, aber dann wird's immer langweiliger und belangloser! Kein Wunder das das kein Hit war!